This year marks the 70th anniversary of Indian Independence. On 15 August 1947, ‘At the stroke of the midnight hour,’ as India’s first prime minister, Jawaharlal Nehru, sonorously proclaimed, ‘when the world sleeps, India will awake to life and freedom.’ And so it did, but it awoke too to the realisation that its borders had been redrawn, that the state of Punjab in the west and Bengal in the east had been divided in two, and a new country, Pakistan, created to accommodate a predominantly Muslim population. Indian Independence has therefore always been synonymous with the partition of India, with which it coincided almost exactly. The new boundaries of Punjab and Bengal were formally announced only the day before Independence, so that millions of households in those two states woke up to find themselves living in a country that no longer aligned with their religion: Muslims in the southern half of the states having to move north to a new home in Pakistan, Hindus and Sikhs in the northern half having to move south to India. There began what still stands as one of the largest migrations in history, with estimates of between 14 and 16 million people moving across the newly formed borders in the hope of finding sanctuary. Neither the newly created independent governments, nor the British administration in India under its last viceroy, Lord Mountbatten, were prepared or equipped to deal with the scale of this migration, or to contain the religious violence that duly ensued, so the independence of both countries was marked by bloodshed. How many people died in the weeks and months following partition is still unclear: the lowest estimate, given out by the British administration (which had previously pledged there would be no violence), is 200,000 deaths; the highest estimate is 2 million. Easy to see why ‘celebrating’ this anniversary is particularly problematic. Easy to see, too, why teaching it in schools – whether in this country or in India or Pakistan – has often appeared too challenging to take on. Families were riven in the process of partition, and many continue to maintain a cloak of silence over the events; where there is discussion, there are so many contested narratives that it feels impossible to present it with sufficient historical detachment. For all these reasons, it’s not surprising that so little is known now about this period of Anglo-Indian-Pakistani history. 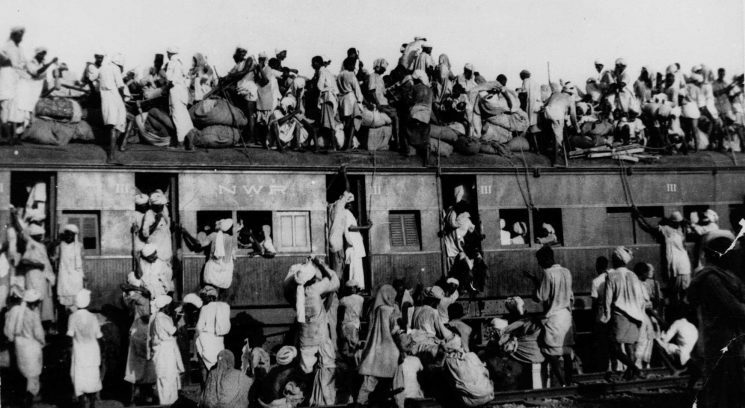 Muslim refugees clamber on top of a train leaving New Delhi for Pakistan in September 1947. There are signs, though, that this might be changing. Last Wednesday, 15 February 2017, the Runnymede Trust’s report into the Partition History Project (PHP) pilot school programme was presented in the House of Lords to a packed council chamber. The pilot had been delivered in the winter term of last year, a time of heightened sensitivity around the issues of migration as a result of the EU referendum and the US presidential elections. It was delivered in four schools in Luton and Hitchin, with markedly different student populations, all of which, however, even those with a significant proportion of students of Bengali or Pakistani heritage, knew very little about the events. The pilot combined history lessons delivered to key stage 2 and 3 students, and the showing of a play, Child of the Divide by Sudha Bhuchar, which told the story of partition through the experience of one child. The headline results of the report are staggering, with a 70 per cent increase in students’ understanding of the events and clear indications that the use of drama, as a way of exploring an historical event through the prism of one family’s experience of it, had been hugely successful. Perhaps understandably, teachers felt that teaching the story of partition in two lessons was asking a bit much, and the results of the PHP seem to bear this out. Although students retained a considerable amount of information, there was also some confusion about the circumstances leading up to partition, the identity of the key players in the events, the scale of the displacement that resulted and the nature of the religious groups affected. Two clear messages emerged: first, that teaching the history of partition effectively has to be undertaken in the context of British rule in India and in a broader discussion of Empire; and, second, that the subject of partition has particularly rich potential for a discussion of some of the issues of the day, including community cohesion, migration, religious pluralism and the legacy of Empire. Often these issues are confronted more comfortably through the prism of an event at some historical distance from the present. Lady Desai, who will be delivering the Migration Museum Project’s annual lecture later this year on partition, spoke from the panel with passion and interest about the process of establishing the first Partition Museum, which is due to open in autumn this year in Amristar. What is clear is that, although there are many who would still prefer partition to go undocumented or certainly uncommemorated, there are even more people who recognise this as their story and who are clamouring to be involved in it. That same sense emerged from the response of the meeting to the panel’s discussion. Time and again people spoke about how their parents or their grandparents were only now beginning to talk about these events, having maintained a silence for the best part of 60 years, making them – the children and grandchildren of partition – viscerally aware of the division that it had caused in their families and extended families. The worry is, people who lived through these events are now in their 80s and 90s themselves: are we going to be able to capture their first-person records before (morbid thought) they leave us? But there were a significant number of positives about the project, the report and the meeting, too. It was heartening to hear about the creation of an institution unafraid to commemorate such a complicated period of its country’s history. It was good, too, to feel that in this country there was an appetite for confronting historically contested narratives and encouraging some dialogue around them. It was reassuring, from the selfish perspective of the Migration Museum Project itself, to see how successful the use of drama had been in the pilot’s delivery, since we have long maintained that the human stories of migration have a weight and a pull that ‘objective’ accounts get nowhere near. And it was good, too, at a time when it occasionally feels that people are retreating into themselves and putting up the shutters, to feel that so many people were hungry to discuss these difficult matters and to throw open the curtains and let the light in on what had previously been kept under wraps. The Runnymede Trust is an independent charity ‘working to build a Britain in which all citizens and communities feel valued, enjoy equal opportunities, lead fulfilling lives, and share a common sense of belonging’. The report mentioned in this blog may be downloaded here; anyone interested in finding out more about the report or about Runnymede is welcome to write to Farah Elahi, research and policy analyst at Runnymede.